Where do I use my Maverick and Wolf voucher code? Boasting an extensive catalogue spanning over 30 different designer eyewear brands, Maverick & Wolf works with the highest designer eyewear suppliers and manufacturers from their headquarters in London. The typical consumer at Maverick & Wolf is someone who looks to purchase stylish, comfortable and affordable eyewear. In fact, shopping online using one of our money-saving deals or voucher codes can help you save on your next eyewear purchase so don’t hesitate to browse our page today! Everything created at Maverick & Wolf is designed with quality at the forefront. Boasting big name designer brands such as Celine, Gucci, Hugo Boss, Moschino and so many more, Maverick & Wolf isn’t your typical eyewear retailer - This prestigious brand guarantees luxury styles both for casual wear and prescriptive use. Maverick & Wolf also have the option of supplying limited edition items and new releases before anyone else giving you an exclusive selection of items you won’t find elsewhere. What’s more, if you see a pair of sunglasses or glasses you would like to purchase that isn’t listed on the site, contact the customer service team and they can order them directly from their manufactures! When it comes to Prescription sunglasses, there is a heap of benefits which firstly protect your eyes but more importantly, ensure you look as stylish as ever. Having custom-made lenses fitted with your prescription gives your eyes 100% UV protection and offers a wide choice of styles just like non-prescription ones. The ultimate advantage to having prescription glasses means you have the freedom to customise your glasses. Perhaps you would prefer to have a scratch-resistant treatment or an anti-glare coating. Maybe you love the style of your frames but prefer another colour lense? Why not switch it up and personalise those shades and show off your style. Delivery costs can vary per item. For more information, visit the delivery page. If you wish to return a product, you can return the item up to 14 days after the delivery/collection. You will need to include your invoice or a letter with your name and order number and the reasons for returning the eyewear. Please also state whether you would like to exchange the item or request a full refund (excluding any returns or postage fees). Specialising in modern and stylish eyewear including designer sunglasses & prescription glasses, Maverick & Wolf are proud suppliers of fashionable eyewear solutions for style conscious men and women. The company has earned a reputation for supplying luxury products from trusted brands including big names like Gucci, Tom Ford and so many more. 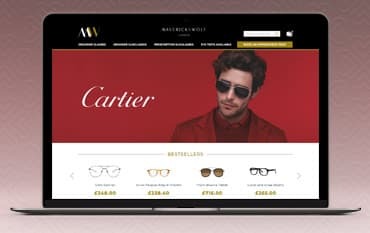 Shop online using of our Maverick & Wolf Voucher Codes to secure money off the perfect pair of sunglasses or glasses for you.